Dual Ball Bearing GT2871R turbo (base Garrett P/N 472560-15) assembly with T25 style turbine inlet. Comes with internally wastegated style T25 style turbine housing and GT28R style compressor housing. Does not include a wastegate actuator bracket and actuator from the factory, but added by ATP, choose from GT28R style or GT28RS style actuators. 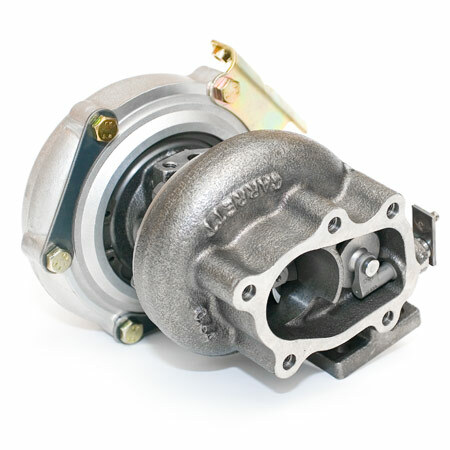 This turbo is great for small displacement engines up to 2.2L and has the ultimate spool up time compared to other units. This turbo has a flow capacity of about 400HP. The external packaging of this turbo can be identical to that of the GT28R (if GT28R style actuator is chosen) and can be a nice stealty upgrade to step up to 400HP of flow without much re-arrangement. GT28RS style actuator is available for kit applications where the ends housings are similar, but the wastegate position is unique.